Your workforce is out in the field every day, and you need to be able to contact them no matter where their job takes them. Our MOTOTRBO Commercial System provides you with high quality, voice and data communication, simply and affordably. You need communications where you do business. The network provides roaming capability between our sites in both Washington, Oregon and California to deliver wide area coverage for your multi-location or fleet-based business. Two-way radios are the go-to technology for enterprises around the world – connecting people wherever they need clear, instant and reliable communications. 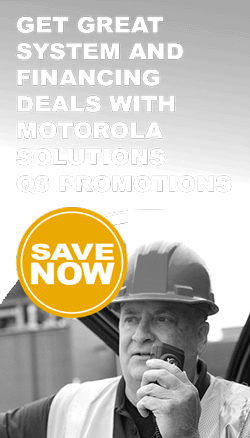 MOTOTRBO is a portfolio of digital two-way radios that enable voice and data communications. It combines the best of two-way radio functionality with the latest digital technology for instant communicating, easy decision-making and seamless coordinating. MOTOTRBO radios offer a smart feature in digital mode – Intelligent Audio – that adjusts radio volume to fit an environment's noise level. This means the radio automatically boosts the volume level when the utility repair truck is rumbling down the highway, then automatically reduces the volume when he pulls up to the job site. Think Cell Phones are Good for Business? Think Again. MOTOTRBO's advanced digital technology supports data applications, including Text Messaging Services, which enables text-format communication between radios and dispatch systems, between radios and email-addressable devices, and to remote PC clients attached to radios.